In honoring Shea's death, the evangelical organization noted that the singer had "carried the Gospel in song to every continent and every state in the Union." "I first met Bev Shea while in Chicago when he was on Moody Radio," Graham said in a statement. "As a young man starting my ministry, I asked Bev if he would join me. 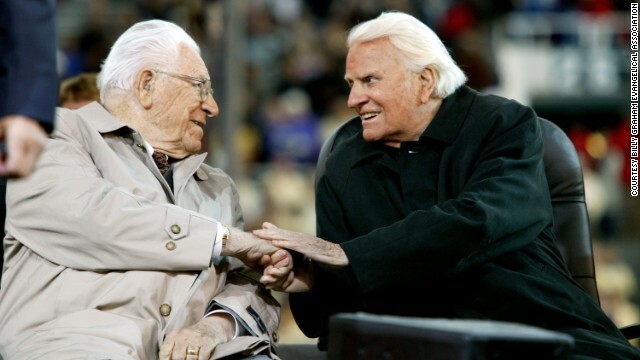 He said yes and for over 60 years we had the privilege of ministering together across the country and around the world." He continued, "Bev was one of the most humble, gracious men I have ever known and one of my closest friends. I loved him as a brother." Reaction to Shea's death lit up Twitter, with fans across the country remembering "a remarkable man" who led a life of "great significance." Shea recorded more than 70 sacred music albums, according to the Billy Graham Evangelical Association. The work earned him a Grammy in 1965 - for his "Southland Favorites" album - and nine other nominations from the prestigious organization. Additionally, the Grammy organization honored Shea with a Lifetime Achievement Award in 2011. "Even though Bev was 10 years older than my father, he never acted his age," Graham said. "He was absolute fun to be with. Bev was one of the most gracious and unassuming men I have known. He was always encouraging and supportive, a man of deep faith and strong commitment to Jesus Christ." Shea, born in Winchester, Ontario, on February 1, 1909, was the son of a Methodist minister. His father taught him the violin, and his mother taught him the piano and organ. He started singing in the choir of his father's church. Shea is survived by his wife, Karlene, and two children from his first marriage, Ronald and Elaine, according to the Billy Graham Evangelical Association. Hey Scott.........................Facts work best for teaching children ! Is there no Christian anywhere who can capitalize and spell and use proper grammar? The truth..you appear to have little grasp of evolution even though you are a product of it. We do not harass Christians,, at least any worse then you may harass gay folks. what you may call "harassment" is actually normal questions which due to the fact you have no answers may feel like harassment to you. That's the problem of "learning" a religion and not being able to question it. Do you have a valid point, or are you just enjoying being as stupid as possible? @ All in need of a Saviour...... your comment about blind and deaf ...... Im not blind i can see the sun .. tangible ...... i can see and hear the train .... tangible, however i look both ways before i cross a street because there is no imaginary person above protecting me. “No one disbelieves the existence of God except he to whom God’s existence is not suitable”. We will pray for you, "Righteo." He was a wonderful person with a magnificent voice. He is now singing with the Lord! RIP, Mr. Shea!